With a thrilling narrative that sheds much light on recent events, this national bestseller brings to life the 1953 CIA coup in Iran that ousted the country¡¯s elected prime minister, ushered in a quarter-century of brutal rule under the Shah, and stimulated the rise of Islamic fundamentalism and anti-Americanism in the Middle East. Selected as one of the best books of the year by the Washington Post and The Economist, it now features a new preface by the author on the folly of attacking Iran. An easily read account of the U.S. and British actions to overthrow the Iranian Prime Minister in 1953 that lead to the entrenchment of the Shah in Iran and ultimately to the Iranian Revolution. This book provides a great perspective from both sides in this action and is a great warning to the hazards of unintended consequences when getting involved in the internal affairs of foreign governments. Thrilling Read, Highly Important History. "All The Shah's Men" by Stephen Kinzer is one of those rare works that exposes and explores a little-known moment in world history that is of high importance for our own times. The book chronicles how the U.S. and Britain pulled off a coup in Iran in the 1950s, overthrowing an elected government and setting the stage for what would become the Islamic Revolution of 1979. There has never been a more timely moment to pick up this book which explains the past, but it has priceless insights into the present. Kinzer has even included a new preface in this latest edition where he discusses the current spike in tensions and rhetoric from the U.S. towards Iran and the grave danger of a possible military confrontation and what it could mean. In rich, fascinating detail and thrilling pace, Kinzer takes the reader through Iran's most fascinating moments in history ranging from its glory days as the Persian Empire to its time as a colony under British rule. Kinzer brilliantly looks at Iranian culture, how the Shiite religion plays a role in the Iranian character and has shaped the nation's attitudes and social structure. There are interesting moments dealing with the discovery of oil in the country and how this especially turned the area into a target for colonial interests. After this educative introduction to the country, Kinzer then focuses on the political upheavel Iran faced during the 1930s and 1940s when a parliamentry system was installed to sit next to the reigning monarchy. This came about during a time of intense nationalism which finally climaxed in the election of Mohammed Mossadegh, a fierce nationalist who's main goal was to nationalize Iran's oil which at the time was completely controlled by the British. Iranian oil was helping keep the British Empire afloat and giving the British citizenry a cozey lifestyle while Iranians lived in horrendous poverty, especially the oil workers at the Abadan refinery who lived in tin shacks while their colonial masters enjoyed golf courses, cinemas and luxurious clubs. Kinzer's exploration of Mossadegh is deep and fascinating, reading you realize that Mossadegh deserves a place among the great nationalist leaders who have been known for their clashes with imperialism like Mandela, Lumumba, Fidel Castro and Hugo Chavez. He comes across as a highly intelligent, charismatic character who felt a deep pain for his nation's suffering and was willing to face hell in order to liberate his people. The moment where Mossadegh speaks before the UN is especially memorable. "All The Shah's Men's" main storyline focuses on how the battle for oil independence by Iran led to a joint British/U.S. operation to overthrow Mossadegh and re-install the Shah who was willing to serve all his master's demands as long as his throne and authority were kept secure. These are some of the books most enraging, thrilling moments as key historical characters such as Dwight D. Eisenhower, Winston Churchill and CIA director Allen Dulles make appearances, divising massive propaganda, sabotage and destabilization plots to bring down a nationalist government threatening imperial hegemony. Kinzer's book looks at the past, but is highly important for the present because once again we face a situation where a dominant power in the world might intervene violently in Iran, but as anyone who reads "All The Shah's Men" learns, this is not a wise course of action. The intervention carried out in 1953 lead to years of brutal repression which in turn led to the Islamic Revolution and the regime we are dealing with today. Kinzer brilliantly explores Iranian culture and the history of a people who have been punished endlessly for trying to control their own natural resources, this makes the story quite universal considering the struggle of Mossadegh in the book is the same struggle we see today in nations like Venezuela, Bolivia, Cuba and Asia. "All The Shah's Men" is the answer to these radical, right-wing, religious books we have been bombarded with promoting war with Iran based on simplistic reasons when in fact, the history is much more complex. Kinzer writes "All The Shah's Men" with a great eye for detail and provides in-depth analysis, documents, rare news reports and speeches to take us back in time. Like his other brilliant work on imperialism, "Overthrow," Kinzer also captures the human aspect and provides great personal, psychological details of the characters and how they were shaped by and related to the historical event in question. The book also serves as a nice crash course for anyone who wants to become familiar with Iran and its history, Kinzer does some excellent historical research that proves to be very valuable in understanding how this controversial nation has been shaped and formed. "All The Shah's Men" is a brilliant chronicle and great resource, it is one of the best books available on Iran and the best record yet on what can be seen as the most crucial Western intervention in the Middle East in the last century before the Iraq War. A timely work and a timely warning. The UK-US overthrow of Mossadegh was clearly one of the worst foreign policy moves in our history. It parallels the simlar Eisenhower directed overthrow of Guatemala's democratic leader Arbenz, for which we still pay.But the conclusion that the Iran move is at the "root of Middle East terror" is not IMO correct. That root stems from Palestine which most of the world views as a kind of concentration camp run by Israel with the aggressive support of the United States. Until we resolve that issue, the so called War on Terror is futile. It is not about the Oil he ( Bush )said. over eighty year only the explanation of it changes to suit the needs of the speakers. Stephen Kinzer writes a great history book that reads like a spy thriller. He details the rise of oil and the importance it has for the west in the two World Wars and the fact that the British were unwilling to give up control of the Iranian Oil Fields. Eventually, American policy formulated by the Dulles brothers, leads the American CIA into overthrowing Mossadegh's government in 1953 and putting the Shah into power. For about 26 years the Shah runs Iran, but the inner frustration and anger towards American involvement into Iranian politics results in the 1979 hostages taken in Tehran. Kinzer does an excellent job with the details of the CIA and British intelligence as he clearly describes what was going on with the Iranians, the British and the Americans throughout the overthrow of Mossadegh. To write a good history book like this one an author needs to do well in three separate areas. He needs to research the topic at hand, write a readable account and finally analyze the events. Kinzer performs exceptionally well in all three areas. First, the book is meticulously researched. He discusses appropriate history without going into unnecessary or boring details to give the reader an appropriate context and background leading up to the 1953 coup. He also uses a diverse set of resources which leaves no holes in the story. Second, Kinzer's writing is engaging and at times suspenseful. In fact at the end of many chapters, I was unable to put the book aside and take a break from reading due to the suspense Kinzer created. The story is very easy to follow and the reader needs practically no background to follow the events. This is particularly impressive given the relative short length of the book. My only criticism is that I wished he had summarized the cast of characters in an appendix or in the beginning as many similar books do. Finally, his analysis, while many have called too liberal, is even handed. He makes a leap by implying that 9/11 events may have not happened if it weren't for the 1953 CIA led coup. Of course we will never know for sure. He supports his claims convincingly that the coup led to the eventual 1979 hostage crisis and the anti-American feelings in the Middle East. Liberal bias? The facts speak for themselves. The CIA using American tax payer money to overthrow a popular and democratically elected government. We, in the USA, would not appreciate if foreigners overthrew our government so why have a double standard? Perhaps Mossadegh is being glorified too much and ultimately he would have led Iran towards the wrong path, but the point remains that we will never know thanks to the coup. Kinzer does entertain the possibilities that Mossadegh would have been terrible for Iran and the West so I reject the idea that he has a strong liberal bias. If you, like me, find the "Death to USA" chants and hostage taking barbaric and puzzling, this book will offer you fresh insights and help you understand the roots of these actions. You will become a lot smarter and more knowledgeable about the Middle East after reading it. I highly recommend this book. All the Shah's Men is considered by many to be the 'standard' book covering the subject of the 1953 coup that ousted Prime Minister Mossedegh and it's easy to see why. The book is very well written and you'd never get the idea from reading the book that there's anything wrong with the author's interpretation of the event. There are however, as many bad parts to this book as there are good parts. The first problem is that the author reissued the book this year with a new preface titled "the folly of attacking Iran." This new preface is the only change to the book and it's written in such a lazy way that criticisms accusing the author of a money-making grab are totally warranted. The author rattles off a chapter criticizing the Bush administration for what the author thinks policy towards Iran is without really examining what current policy towards Iran actually is. This new preface comes across as the liberal equivalent to Fox news. If it's wrong when Fox offers up this type of 'analysis,' it's wrong when the opposite interpretation adopts the same tactics. The second glaring deficiency is all of the available sources that the author doesn't use. When you take into account the amount of declassified material from the years covered in the book, it's shocking that the author only has 14 pages of notes from a remarkably small amount of sources. A wealth of declassified government documents exist from this period on both the American and British sides, and the author uses next to none of them. Another problem is that the book is billed as the story of the 1953 coup, but save the first introductory chapter, you don't even start hearing about the coup itself until around page 150 of a 228 page book. The bulk of this book deals with Iran and its struggle with the British during the late 40s and early 50s. I think the fact that the author doesn't use the wealth of material on the coup itself is the reason for this. The fact that the U.S. is mentioned in the subtitle but the British aren't is ridiculous. Upon finishing the book, the reader will notice that the U.S. has very little to do with what the book actually deals with. Again, perhaps a crass decision to sell more copies since fewer people would buy the book if you replaced "American" with "British." Reading the last chapter also provides numerous reasons to question the usefulness of this book. Kinzer jumps back and forth with relative ease to several contradictory viewpoints. At times he warns against citing a particular historical event as the reason for another event in the future, but then claims that it's 'not too far-fetched to draw a line from the 1953 coup to the Shah's repressive regime and the Islamic revolution to the fireballs that engulfed the World Trade Center in New York." It's ridiculous that this entire book was written by the same person when taking into account the number of contradictory views within. I have to say I am troubled by the many reviewers who say they loved this book, except for the idea that America's actions could have possibly contributed to the hatred anyone feels toward us. To say there is a connection is not the same as saying we deserved it, and the author by no means makes any suggestion that 9/11 was something reasonable or deserved. To deny the connection is to go blind into today's events. Growing up in America, I was never told that the Iran hostage crisis was related to Jimmy Carter's willingness to shelter the deposed Shah after the 1979 revolution. I think it's pretty clear that the same hatred toward America that was behind that crisis played a significant part in leading up to 9/11 as well. 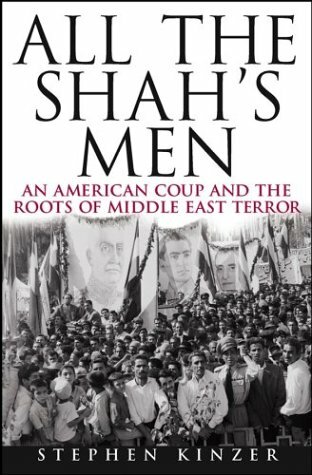 This book helps explain how America's role in proping up the Shah contributed, however unintentionally, to the rise to power of radicalism in that region. The book focuses on a few characters who played significant roles in the events in order to make the story more personal and interesting. To bring in all the issues of the times, or try to cover all the significant players in detail, even on the American side, would have probably made the story unreadable. The result is a highly readable and generally fascinating history. The book also spends time explaining, briefly, the larger history of Iran and the reasons why Iran's branch of Islam is different from other branches. This serves to bring the events of 1953 into much clearer perspective. This section is inserted into the middle of the main narrative, and I was impressed by how much richness and depth the remainder seemed to acquire with the new knowledge gained. All the Shah's Men attempts something seen but rarely accomplished in such an insightfully brilliant composition. Covering the events of the Anglo-Iranian oil embroilment, Stephen Kinzer attempts to take a neutral position on the ordeal but careful juxtaposition of events and seemingly minor inadvertent details hints otherwise. It must be realized that there is nothing in this text that is thrown casually together or without cause; the subject material is intrinsically complex: the very thought of organizing a tale as historically convoluted as this one seems a near incomprehensible act. It leaves only the conclusion, then, that every clause is carefully chosen and every concept lent an overarching purpose. Stephen Kinzer has taken to the high hills of neutrality while also subtly imparting his own thoughts from its grounds. However that is not to say that he implants a wholly biased view. No, in fact there is a masterful genius in the way that he presents both sides of the issue without asking the audience outright to make judgement on either side. It should be noted that this is hard not to: one would find it difficult to read on the roots of what has amounted to a country's centuries old struggle for stable government and national unity. But, fortunately, it is not required of the reader to take any such stance. Indeed, it is not until the very end that any sort of analysis is even attempted. Then, too, Kinzer remains aloof behind the analysis of other historians of which he quotes extensively and interjects only to raise possible quandaries that they - not he - expose. It is difficult to describe just who Kinzer is trying to reach here but it stands apparent that the man is passionate about his subject and wishes to get word out. At its core, All the Shah's Men is a tale of misunderstandings, stubborn actions, and lost opportunities. The novel details the U.S.'s involvement in a coup overthrowing Iran's revolutionary, progressive leader at the time Mohammad Mossadegh. While popular in his home country for nationalizing the oil industry, he ran afoul British (and consequently American) interests with his actions. Replacing him was Reza Shah who was seen mostly as the U.S.'s puppet government. Needless to say, this has caused what can only be understated as constant strife in the region and involved countries' relations. Kinzer ties this tale into coherency with an air of moralistic impassivity. What passes in his book is intriguing, disheartening, and as he is quick to remind - above all historically accurate. One feels that, upon closing the final chapters they have uncovered a great virtuosity and reached a profound understanding of often muddy governmental policies. If anything, one knows that they have definitely been handed a guide on how not to run foreign policy. There is the implied concession on the advantages of hindsight, but then again, there is too that implied (however not always limited to such subtlety) concept that pigheadedness - easily identifiable during the run of its course - was, too, a large contributing factor. All the Shah's Men succeeds not only because of its well accomplished attempts to organize often baffling quandries of political events, but also because of its effective use of what can best be described as stratification. While it would have been easy to cop to dividing the social castes inherent in the Anglo-Iranian crisis (and a major fuel to the lasting bitterness) Kinzer instead identifies the many overlaying sociological strata of the issue. We are given an overview of the issues highly charged history rife with symbols of religious martyrdom and political tension. The apparent psychological epidermis of the crisis is tilled handily before delving more into the heart of the issue in an effort of attaining an all-encompassing understanding. Without pandering to superficial conclusions or extraneous events, he gives us the breadth of the situation with a vision of multi-layered depth often gone unseen with such wells of temperance. The ball is missed in a few spots, though. His straight-line recount of events feels empty at times as the mechanical linkage of occurrences leads to a concise - however dry - tale. As aforementioned, the balance of fact and opinion however much implied by Kinzer or falsely placed by the reader, is an unbalanced mix that somewhat detracts from the ruminative insights that he is oft to make. With all the tension in the Middle East, could there be a potential military threat facing the United States? In trying to unravel the current Middle East Crisis, it's necessary to examine the past. There's little debate that the majority of the Arab world has considerable contempt for the U.S. But how exactly did we earn such hatred among these oil baring countries? How deep is this animosity and could this lead to an eventual war with a nation like Iran? If so, how are the allegiances divided and what are the military capabilities of the major players? All the Shah's Men probes into the history of Iran, concentrating on the negative involvement of the United States. The book focuses on the details leading up to and including the history of Operation Ajax; a 1953 covert operation by the United States and Great Britain to remove Iranian Prime Minister Mohammed Mossadegh from power in support of the western friendly Shah Mohammed Pahlavi. According to the book, the roots of hatred towards the United States in Iran have long been buried in oil. From the 1930's until the early 1950's the oil in Iran was controlled by Great Britain. But in 1951, the first democratically elected parliament took control of Iran and cut Great Britain off from their oil supplies. In 1953, Great Britain convinced the United States to assist in overthrowing this new democracy and put the ruthless Shah back into power to protect their oil interests. The Shah, with his western friendly policies, allowed the U.S. to control 40% of Iranian oil assets for over two decades following the take-over. It wasn't until 1979 that the Shah was run out of office by Khomeini in favor of an Islamic controlled nation. Between the hostage crisis of 1979 and the U.S. support for Iraq during the Iran-Iraq war, the relationship between the U.S. and Iran began a steep decline in the late 70's. The tensions perhaps reached an all-time high when President Bush added Iran to the "Axis of Evil" list in 2002. Still today, many Iranians believe that their country would be a fully established democracy if it were not for the US involvement overthrowing their nationally elected government in 1953. Although written at about an 11th grade level, All the Shah's Men is a very good book. It makes it easy to understand how the hatred has grown between the US and Iran and would make an excellent reference book on Middle East history. The book certainly paints a vivid picture on Iran's desire to harm the United States, but it doesn't probe enough into the "how" of the problem. The book does not go into enough details on Iran's involvement with current terrorist organizations. There is also little discussion on Iran's current weapons inventory, capabilities, and research. To fully understand the problem, we need to know quite a bit more than just "why". This book is the standard reference for a widely accepted but delusional view of Iranian history. The story goes that the great "reforming" "democratic" leader of Iran Mohammed Mossadegh was overthrown by the evil CIA in the 1950s and put in place the "evil" "autocratic" and "unpopular" Shah who was overthrown in 1979 by the masses of Iran yearning to be free. Pity but most of it is not true. Mohammed Mossadegh was not a democratic politician. He was a gangster whose power was based on sending mobs into the streets to intimidate anyone that opposed him and gunning down the opposition. He was never popular in Iran and nobody in Iran shed a tear for him when he died. - (March 1951) Haj Ali Razmara, Iranian Prime Minister, and in the way of Mossadegh is gunned down in Tehran. - (Late 1951) Mossadegh, sensing he lose the parlementary elections, stops the election after a quorum of his supporters are elected. - (July 1952) Mossadegh, after being constitutionally blocked by his opponents resigns and sends mobs controlled by himself into the streets to riot until he is given what he wants. - 1952 - Mossadegh is restored and given the unconstitutional power to make laws by decree for six months. - (January 1953) - Mossadegh's power to make laws by decree outside of the constitution is extended for a further 12 months. He issues a land reform decree which gives him the power to confiscate the entire property of anyone in the country who opposes him. - Mossadegh, due to his autocratic unconstitutional rule and a collapsing economy, becomes progressively more and more unpopular. - (1953) - Mossadeq unconstitutionally dissolves the parliament, abolishes the secret ballot and calls an unconstitutional "national plebiscite" which had an obviously fraudulant result of 99.93% in favor of his dictatorship. - (1953) - Mossadeq suspends parliament indefeniately and rules as an unconstitutional autocrat. It is at this point that Mossadeq is deposed and overthrown. And this is the fraud of the book. The history I've presented above can easliy be verified and what it shows is that rather than being the great democratic reformer that this book and the associated mythology want to make Mossadeq into, he was a thugish unpopular dictator who had personally destroyed every aspect of democratic constitutional government in Iran. The morality of the CIA plot to depose Mossadeq can be questioned, but questioning the right of outsiders to intervene to overthrow a dictator is not the same as making Mossadeq into a democratic hero. The truth must be respected. The other truth that needs to be told is that the 1979 revolution in Iran wasn't a struggle for democracy or human rights or launched in opposition to the loss of democracy in 1953. The people who launched the Islamic revolution in Iran hold democratic government and human rights in utter contempt. The question nobody wants to ask is how it could, following the script, that Iranians who found the Shah's regime so brutal and intolerable in the late 1970s that they took to the streets could within a few years contentedly accept a government that was far more brutal, more autocratic and abused human rights more than the Shah ever did. Stephen Kinzer suffers from all the normal faults of reporters at the New York Times. He is more dedicated to the "offical" national view of history as expressed by the New York Times than the truth. He gets almost everything about Iranian history wrong but he gets it wrong in the same way that American academics also get it wrong. 1953 wasn't the great event in Iranian history that American and British historians want to make it. What the British did in the early 1900s was far worse. When the British militarily illegally occupied Iran in both world wars, that was worse. And for most Iranians the issue that focused anti-american attitudes wasn't 1953, it was in the 1960s when the Shah passed laws putting American soldiers in Iran beyond the reach of Iranian law. Mossadegh is one of the worst leaders in Iranian history. Had he survived, he would have led Iran down the road that Iraq travelled in the 1950s into personal dictatorship and autocratic rule. He inherited a functioning constitutional government and utterly destroyed it. Its time to put the mythology of Mossadegh into the trash where it belongs and start telling the truth about Iranian history. Overall, this book is a interesting, short, and readable account of Mossadegh and the CIA sponsored coup that overthrew him in 1953. It flows quickly (sometimes too quickly) and is superb at detailing the debates between British, American, and Iranian officials on how to respond to the nationalization of Anglo-Iranian Oil. The British, not the Americans or Iranians, become the real villains in this story. In fact, Churchill plays an interesting role, one of which most Americans and Brits, who fondly remember their WWII hero, are unaware. While some have questioned the author's supposedly naive admiration for Mossadegh, I found that Kinzer balances his obvious condemnation for the coup with revelations about Mossadegh's flaws (emotional rather than logical discussions, fainting spells, stubbornness, etc.). Indeed, Kinzer does make a compelling case that the coup was really ordered to protect a corrupt oil company and pathetic Shah, with Americans fooled into seeing a communist threat. I did think the preface to the 2008 book on attacking Iran did not help, since injecting current political debates merely labels Kinzer's historical account. While I agree with Kinzer and think invading Iran would be a disaster for the reasons he says, I could understand how the preface might color the rest of the book by suggesting that anyone who supports a tough line against Iran now should also disagree with the author's assessment of the 1953 coup.